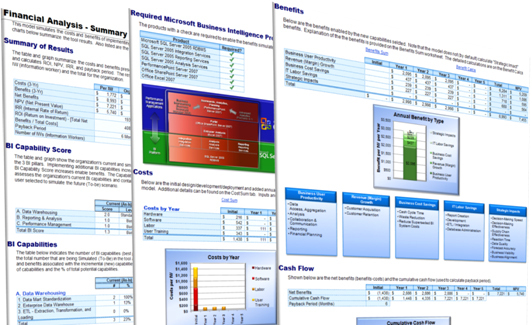 This comprehensive Excel-based tool enables organizations to credibly assess/estimate the costs and benefits (ROI) of investing into Microsoft's business intelligence products/services. Microsoft products in this tool include: Office 2007, Office SharePoint Server 2007, Office PerformancePoint Server 2007, SQL Server 2008, Windows Server 2008, BizTalk Server 2006, and Visual Studio 2008. 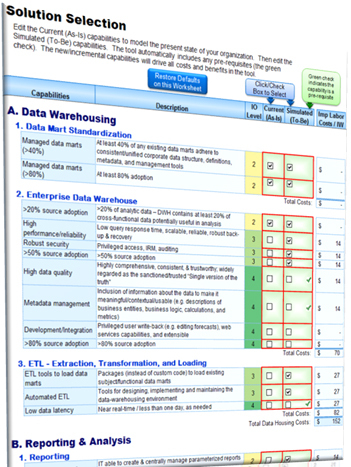 The model also assesses the organization's "BI Capabilities" (best practices) in 9 categories: 1) data warehousing, 2) performance management, and 3) reporting and analysis. The "BI Capability" assessment is based on Microsoft's BI Maturity Model (part of Microsoft's Infrastructure Optimization Maturity Model). The results can be used as a key part of a business case for BI projects. It can also be used by Microsoft product vendors and service providers to articulate the business value of their Microsoft BI solutions. Costs: Includes hardware; software; IT labor, training, and services; and user labor and training. All direct and indirect, one-time and on-going costs needed to implement and support the initiative. Benefits: IT labor TCO savings, other direct costs savings, user productivity benefits, revenue growth, and potential impact on non-financial KPIs (key performance indicators). Supports rapid (30 minute) or detailed (5+ day) assessments - The models are designed to provide either a rapid assessment (by just entering/selecting basic organizational profile data) or a very detailed (5+ day) assessments by modifying hundreds of detailed inputs. Comprehensive financial analysis - Calculates project cash flow, cost-benefit analysis, ROI, NPV, IRR, and payback period. Pre-populated with default/sample costs and benefits* - Sample input data is pre-populated throughout the model and is re-calculated as inputs are modified. Data/estimate sources are listed. Users may overwrite any of the pre-populated defaults. Based on industry-standard calculations and industry-leading methodologies - The models are as transparent as possible so the user is able to understand how the costs and benefits are calculated. User-friendly - The workbook contains instructions, descriptions, and references. Results are updated real-time and are displayed graphically throughout the model. Although the model is user-friendly, we recommend users have at least a moderately-advanced understanding of technology and business value concepts to develop a credible business case. This model assesses the costs and benefits of enhancing (investing in) the organization's business intelligence (BI) capabilities. The model assesses 9 generic (not Microsoft-specific) BI capabilities (best practices) in the following 3 categories: 1) data warehousing, 2) performance management, and 3) reporting and analysis. 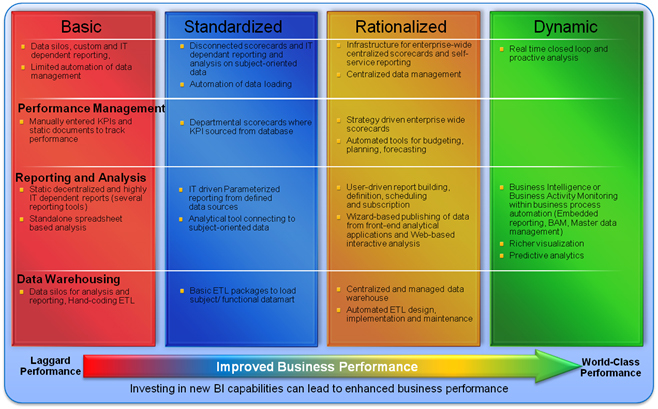 The model calculates a "BI Capability Score" based on the extent to which the organization possesses these 9 BI capabilities. 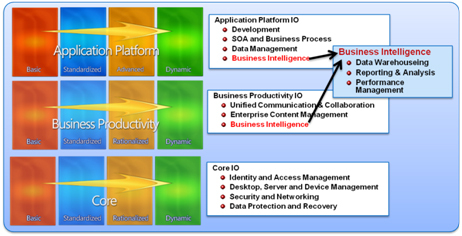 The BI Capabilities are based on Microsoft's Infrastructure Optimization (IO) model. Business intelligence is included in 2 of the 3 models: BPIO (Business Productivity Infrastructure Optimization) and APIO (Application Platform Infrastructure Optimization). These IO models are based on research from Gartner, IDC, MIT, and others. Research from these organizations, Microsoft, and others has shown that there is a strong correlation between maturity/capability levels and business performance: business performance tends to improve as the organization invests into advancing capability levels. The model then simulates a "To-Be" BI Capability Score based on additional capabilities (solutions) selected. The model simulates improvements to appropriate KPIs (Key Performance Indicators) corresponding to improvements to the BI Capability Score. The KPI improvements are translated into financial benefits in the following categories: user productivity, IT labor, cost savings, and revenue growth. The model also estimates costs required to implement the new capabilities/solutions, including hardware, software, IT labor, and user labor. The results (including cash flow, ROI, NPV, and payback period) are included in the "Financial Analysis" tab. The model is based on industry standard methodologies and calculations. It is as transparent as possible so the user is able to understand how costs and benefits are calculated. The model uses many estimates/assumptions/defaults (salaries, hardware costs, KPI values, etc.) Research was conducted to find highly reputation sources for these. Data/estimate sources are provided. 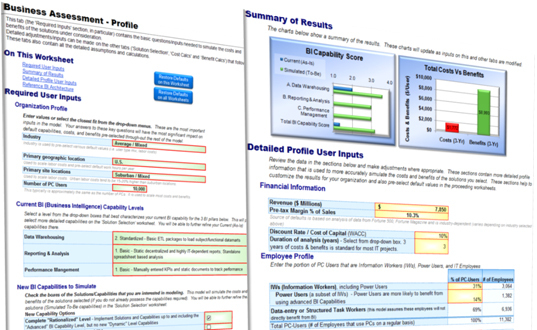 This model was designed to provide either a rapid (1 hr) assessment (by just entering basic organizational profile information and selecting new capabilities) or to conduct a very detailed (3+ day) assessment by modifying detailed input cells. This tool was developed by Hall Consulting & Research LLC (hallcr.com) for Microsoft. 1. This is a free "Preview": You may use, copy, redistribute, display, print, and reproduce this software/document. 2. You may NOT sell, rent, lease, or lend this software/document or portions/derivations of it. 3. You may NOT create derivative works from or "reverse-engineer" this software/document. 4. You may only modify portions of the software/document designated as "Input" cells (light yellow cells with double-outline and blue text). 5. You may NOT attempt to modify any "Protected"/"Locked" portions of this software/document. 6. You must maintain all copyright and other notices contained in this software/document. 7. You may incorporate only static (e.g. values, graphics) portions of this software/document within other documents (e.g. a business case report) as long as the dynamic (e.g. equations, macros) functionality of the workbook is not also incorporated or duplicated. HCR can provide fee-based support services, including telephonic support, workbook customizations, and comprehensive consulting engagements to assist with business case development and validation. The Infrastructure Optimization (IO) model from Microsoft has been developed using Industry best practices, Microsoft's own experiences with its enterprise customers, and is based upon Gartner's Infrastructure Maturity Model and MIT's Architecture Maturity Model. A key goal for Microsoft in creating the Infrastructure Optimization Model was to develop a simple way to use a maturity framework that is flexible and can easily be used as the benchmark for technical capability and business value. The Infrastructure Optimization Model from Microsoft helps customers understand and subsequently improve the current state of their IT infrastructure and what that means in terms of cost, security risk and operational agility. By using this model as a framework, an enterprise can quickly understand the strategic value and business benefits to the organization in moving from a "basic" level of maturity (where the IT infrastructure is generally considered a "cost center") towards a more "dynamic" use when the business value of the IT infrastructure is clearly understood and the IT infrastructure is viewed as a strategic business asset and business enabler. 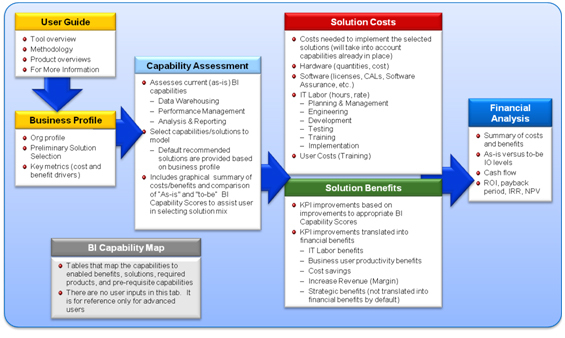 Below is an overview of the BI capabilities included in this model. The model assesses the organization's current level of compliance with the corresponding best practices within each capability category. They are based on Microsoft's BI IO (Infrastructure Optimization) as well as a variety of other sources including Gartner, Forrester, and IDC. Microsoft Business Intelligence offers a complete suite of products that supports all facets of decision making. Through tight integration with the powerful, proven, and scalable Microsoft SQL Server 2005/2008 platform, Microsoft Office SharePoint Server 2007, Microsoft Office Business Scorecard Manager 2005, ProClarity Analytics 6, and Microsoft Office PerformancePoint Server 2007, Microsoft provides complete business intelligence (BI) capabilities that deliver the right information, at the right time, and in the right format. Building on the innovative features in SQL Server that help businesses understand and analyze large volumes of rapidly changing data, the 2007 Microsoft Office system enables decision makers to predict and harness the power of change to create competitive advantages, achieve corporate objectives, and make better decisions, faster. Now, with tighter integration with SQL Server, the 2007 Microsoft Office system empowers people to be more productive by answering their own questions in a security-enhanced, familiar, and easier-to-use environment. This enables IT to focus their resources on higher-value BI projects and enables everyone else to focus on doing their jobs and less on getting the information needed to do their jobs. New to the 2007 Microsoft Office system is a product called Office PerformancePoint Server, an extension and evolution of Microsoft Office Business Scorecard Manager and ProClarity Analytics. Office PerformancePoint Server is a performance management application that enables businesses to improve their performance by providing all employees with the ability to plan, budget, forecast, report, analyze and scorecard their activities using the familiar Microsoft Office system and SQL Server technology. Office PerformancePoint Server will help companies align metrics to strategy and improve performance by enabling every employee to understand business drivers, shape solutions, and execute shared plans. In addition, Office SharePoint Server 2007 introduces Microsoft Excel Services, which delivers the power, functionality, and accessibility of Microsoft Office Excel 2007 in a zero-client format. Now everyone can easily interact with live data over the Web.